Having created a timer or two, the time may come when you want to make some changes. If you're thinking "Yes! That's exactly what I want to do!" then great! You're in the right place. First, open Countdown Sales Timer from your Shopify admin (Apps>Countdown Sales Timer, in case it's been awhile). Accompanying each timer is a button with three dots (also called an ellipsis) and next to that, a button that says EDIT. Hitting that button will open your timer up in the editor where you'll have access to all the same options available as when it was first created. The editor is identical between edit and create modes, save for one important detail: when editing a timer, you'll find a shiny new Delete button at the bottom of your window next to the Cancel button. Hitting it lets you delete your timer for good. We have no way of retrieving it for you after deleting it, so we throw up a confirmation dialog just to be safe. Clicking Delete here marks the point of no return. 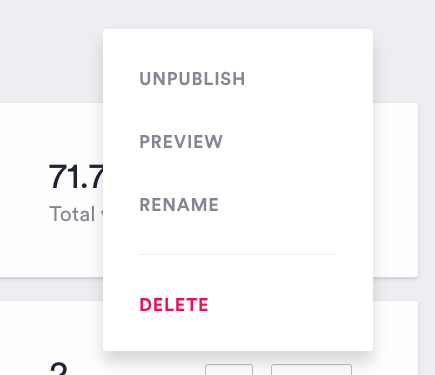 Clicking it reveals four options: Unpublish, Preview, Rename, and Delete. They're all pretty aptly-named. Some of them (like Rename and Delete) will open up dialog boxes, while others will just do the thing (Preview and Unpublish). That's all you need to know to edit your timers! Go forth and tinker!